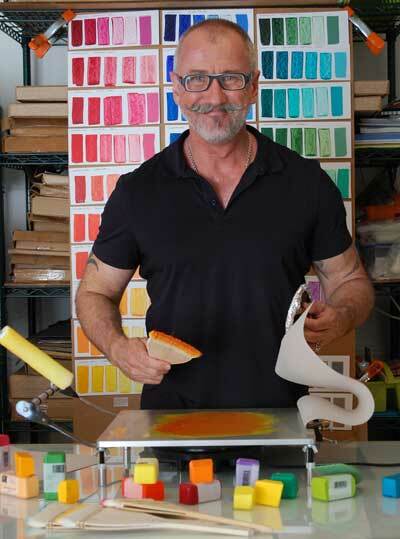 David A. Clark teaches encaustic printmaking across the United States, most recently at Idyllwild School for the Arts, Wax Works West, R & F Handmade Paints, the Palm Springs Art Museum and Truro Center for the Arts at Castle Hill. His painting and print works have attracted national attention for their technical innovation and soulful content. David’s work has recently been shown at the Hunterdon Art Museum, the Cape Cod Museum of Art, Aqua Art Miami, Conrad Wilde Gallery and the Palm Springs Art Museum. David also had a recent solo show of prints at the Process Museum in Tucson, Arizona. That show was devoted to a single encaustic print and the more than 100 process pieces that went into its creation. David’s print work has been published in several books and will soon be featured in the upcoming book, “Encaustic”, from Schiffer Publishing.